Life in Tehran seems to proliferate almost exclusively in interiors. The category of public space as a political “space of appearance” does not seem to apply in the case of the today’s Iranian metropolis. The various political powers that ruled the city attempted in many ways to produce a public space, but they have always met the resistance of the different forms of life which inhabit the city, unwilling to be represented by state institutions. For these reasons, the studio tackles the private, enclosed interior as the center of Tehran’s political life. 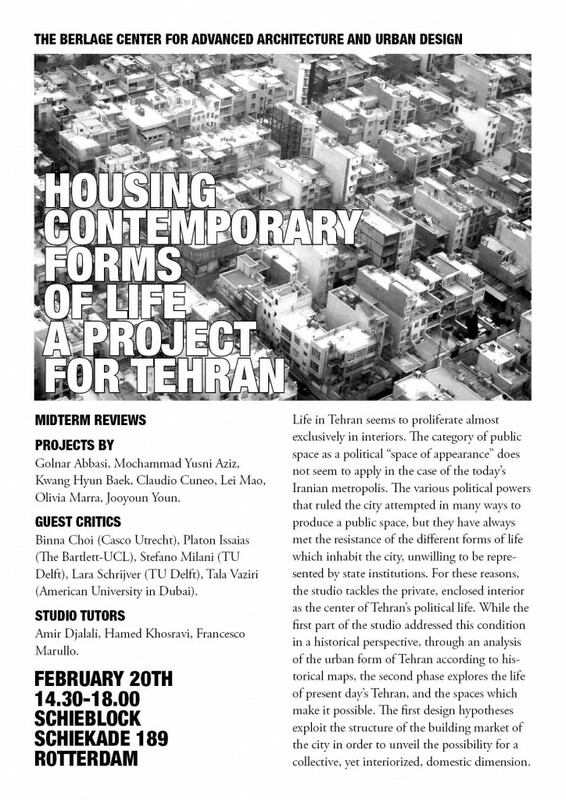 While the first part of the studio addressed this condition in a historical perspective, through an analysis of the urban form of Tehran according to historical maps, the second phase explores the life of present day’s Tehran, and the spaces which make it possible. The first design hypotheses exploit the structure of the building market of the city in order to unveil the possibility for a collective, yet interiorized, domestic dimension. Golnar Abbasi, Mochammad Yusni Aziz, Kwang Hyun Baek, Claudio Cuneo, Lei Mao, Olivia Marra, Jooyoun Youn. Binna Choi (Casco Utrecht), Platon Issaias (The Bartlett-UCL), Stefano Milani (TU Delft), Lara Schrijver (TU Delft), Tala Vaziri (American University in Dubai).